In the area south of the Risnjak National Park, Via Dinarica continues across the area of Tuhobić. 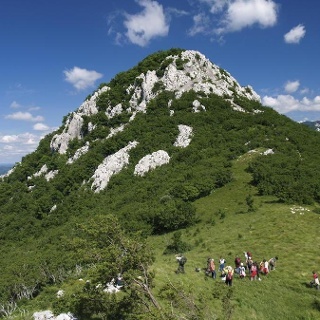 This elongated mountain with steep sides follows the littoral edge of the Gorski kotar plateau from Gornje Jelenje towards Fužine for approximately 5 kilometers. The slopes of Tuhobić facing the littoral side are mild and gradual, slowly descending into the karst fields. On the other side, facing the region of Gorski kotar, steep slopes 300 meters high rise from the valley of Lepenica. The Lepenica side of the mountain is covered in dense layers of mixed forest that almost reach the ridge itself. On the other side of the mountain, Tuhobić is covered in grasslands and rather bare. 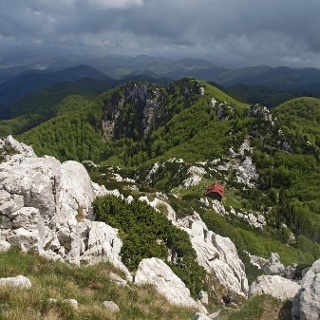 On no other mountain is the boundary between the forests characteristic for Gorski kotar and the karst terrain so sharp and noticeable as on Tuhobić. Two main peaks stand out along the elongated Tuhobić ridge: Stragarnica (1098 m.a.s.l.) and Jelenčić (1106 m.a.s.l.). In high elevations, the mountain is predominantly characterized by lush meadows that offer beautiful views. Approach to Tuhobič; a lot of weed, overgrown sometimes chest and headhigh. Leaving Tuhobič, again a lot of growth, not a much as the other side-I am hiking southbound.